From 1886 until the creation of the National Park Service in 1916 the United States Army was responsible for the administration and management of Yellowstone National Park. However, the park was established in 1872 and for the intervening years, it suffered neglect at the hands of poachers and vandals. The first National Park in the country, the Federal Government had to learn, over several years, what would work best for administering the park. In 1872, Nathaniel P. Langford was appointed as the first superintendent of Yellowstone. However, there was no money available for a salary, so he was forced to make his living elsewhere and during his five-year term, entered the park only twice. The second superintendent was a man named Philetus Norris, who volunteered for the position. Reporting on the problems that he witnessed first hand, Congress finally provided funds for a salary, as well as a minimal amount to operate the park. Additional superintendents followed, but without adequate help, Yellowstone’s natural resources were being destroyed as poachers killed animals, souvenir hunters broke off pieces of geological formations, and developers established numerous tourist camps. The good intentions of these early administrators were no match for their lack of experience, funds, and manpower. As a result, the park turned to the U.S. Army for help. In August 1886, men from Company M, First United States Cavalry, Fort Custer, Montana Territory under Captain Moses Harris came to Yellowstone to begin what would be more than 30 years of military presence in the park. 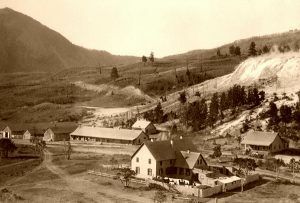 At first, the troops lived in temporary frame buildings at Camp Sheridan, established at the foot of the Mammoth Hot Springs Terraces. After enduring five cold, harsh winters, the cavalry realized there was no end in sight to this assignment. Therefore, in 1890, Congress appropriated $50,000 for a permanent post. Fort Yellowstone was completed by late 1891 and as more troops were needed, additional buildings were constructed including officers’ quarters, a guard house, headquarters, stables, barracks for the enlisted men and non-commissioned officers’ quarters. In the winter of 1894, soldiers caught the notorious poacher Ed Howell killing buffalo. Because no laws existed to prosecute Howell, public indignation caused Congress to pass the Lacey Act to protect the birds and animals of Yellowstone National Park and to punish crimes in the park. In 1903, a building was constructed to serve as the headquarters for the Army Corps of Engineers who were tasked with building and maintaining Yellowstone’s roads and bridges. During their tenure, they constructed over 400 miles of roads as well as building a hydroelectric power plant, which provided electricity for the fort’s buildings, and developing a water system. In 1909, Scottish masons began constructing sandstone buildings in the park including the Bachelor Officers’ Quarters, which now serves as the Albright Visitor Center; two-troop barracks for 200 men, which now serves as the administration building; and later, the Chapel, the last of the structures to be built in 1913. Prior to its completion, religious services were held in the troop mess hall, the post exchange, or in a private residence. The chapel continues to serve the community today. These buildings were built of native sandstone obtained from a local quarry between the Gardner River and the Mammoth Campground. In 1910, at the height of the Army’s presence in Yellowstone, there were 324 soldiers stationed here – plus some families and numerous civilian employees. These troops staffed not only Fort Yellowstone but were stationed throughout the park in small details at various outposts. Over the years, the army built a number of backcountry outposts to provide facilities for troops patrolling for poachers. Typically these were about 16 miles apart, about a day’s travel by horseback. Ranger in front of one of the backcountry cabins. Each cabin was built in a rectangular “Rocky Mountain” style, with sod roofs and dirt floors. Generally built on the edge of a relatively flat meadow, each cabin featured 1-2 rooms which incorporated sleeping, cooking and work areas. 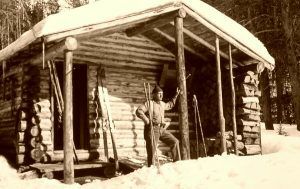 Several of these backcountry cabins still survive today and are still used by the National Park Service for backcountry patrols. Updated today to include shingled roofs and concrete floors, they are located in remote parts of the park that are accessible only by foot and horseback. 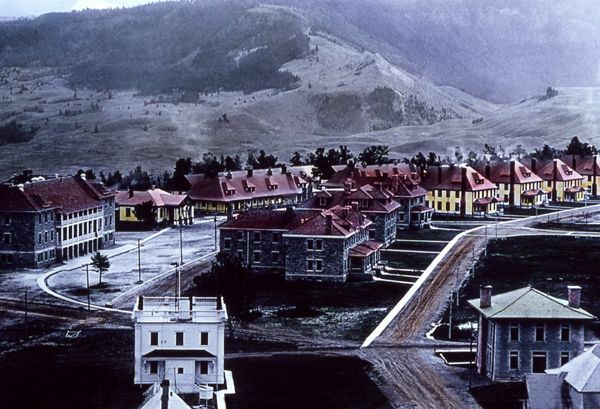 Because of the post’s good facilities, relaxed discipline, and interesting surroundings, Fort Yellowstone was considered a prized assignment by many officers and enlisted men. But protection of the park did not suffer. Soldiers were ordered to “conduct themselves in a courteous and polite, but firm and decided manner” when carrying out their duties. The National Park Service Act was signed on August 25, 1916. Soon after, soldiers were discharged from the Army to form the first ranks of park rangers and a maintenance force. The National Park Service took over protection of Yellowstone National Park, “by arrangement with the War Department, and with its hearty cooperation,” on October 1, 1916. Though local opposition resulted in one last episode of Army residency, the National Park Service assumed full administrative responsibilities in 1918. Today, the Army’s legacy is visible in wood and stone, and in the very survival of Yellowstone as one of the world’s great symbols of the National Park idea. Fort Yellowstone is also noted by conservationists to have helped define how National Parks were to be managed. 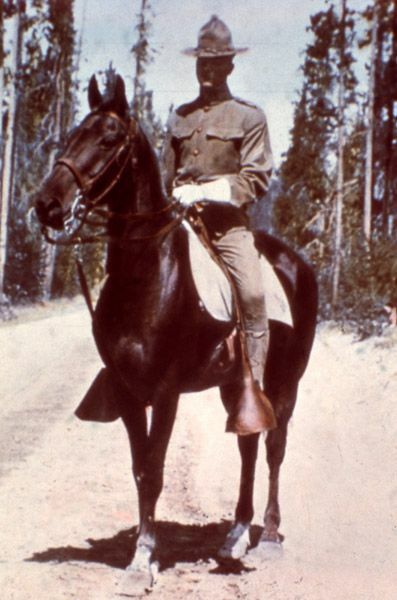 During the Army’s tenure, they developed regulations that put much emphasis on conservation and under their watchful eyes, the features and wildlife of Yellowstone National Park were protected from vandalism and extinction. Many of the policies initiated by the army at Fort Yellowstone were later adopted by the National Park Service. The Army spent 32 years running Yellowstone National Park, the longest period the army ran any National Park in United States history. 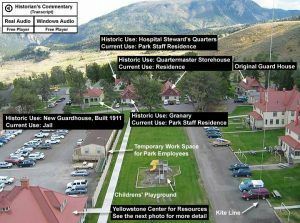 Today, the old post is known as the Fort Yellowstone-Mammoth Hot Springs Historic District, designated as a National Historic Landmark on July 31, 2003. Within the district is the administrative headquarters for the Yellowstone National Park. It is located in the northwestern portion of Yellowstone National Park on an old hot springs formation. 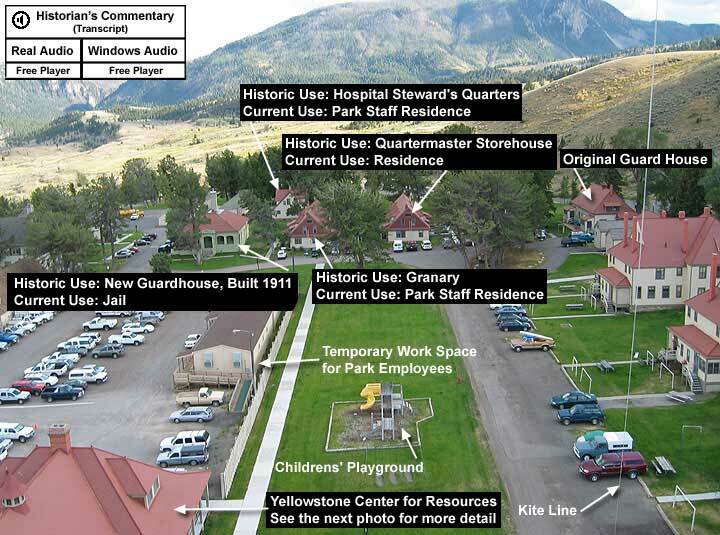 Numerous buildings from Fort Yellowstone’s tenure continue to stand including the Captain’s Quarters, Post Headquarters, Guard House, Hospital Annex, Commissary and Quartermaster storehouses, and several more. A self-guiding trail directs visitors to these many historic buildings.